Stunf – Page 12 – About the web, software development, productivity, startups and our products. 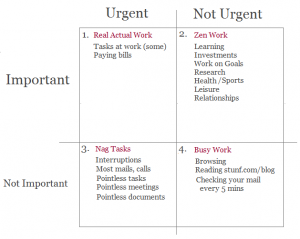 Prioritizing and Planning: The Urgency Trap. A big problem when it comes to task management and planning is assigning priorities. Don’t you just love software that presents you with a lot of priority options when adding a new task? For example, you can set the priority to ‘Important’, ‘Medium’, ‘A little bit medium’, ‘Something less medium’, ‘Not so medium’. Sometimes these priority-levels are expressed as numbers, which is even “better”! Priority of this task? 7. No. Wait. It’s 6, yes that’s it. Or maybe 8. A lot of people sort their Todo List by Urgency (i.e. due date). This is where it goes wrong. The key is that Urgency says nothing about Importance. An urgent task can be important, but it doesn’t have to be. It’s pretty clear that tasks that are urgent and important should be done right away (Real Actual Work).Â So which task will you pick next if your tasks are sorted by due date? Tasks from category 3 – Nag Tasks, because they are also urgent. But didn’t category 3 say ‘Not Important’? It sure did. So why am I working on this? Simply because there’s some feeling of urgency to these tasks. The Nag Tasks (3) are the worst kind of tasks. They usually don’t help your long term goals and interrupt you from important things. There’s just too much of this stuff: writing useless emails or documents, or pointless assignments. To make it worse, after working an entire day on category 3 tasks, you feel like you did a lot of work but didn’t really achieve anything. It didn’t help you get closer to your goals. 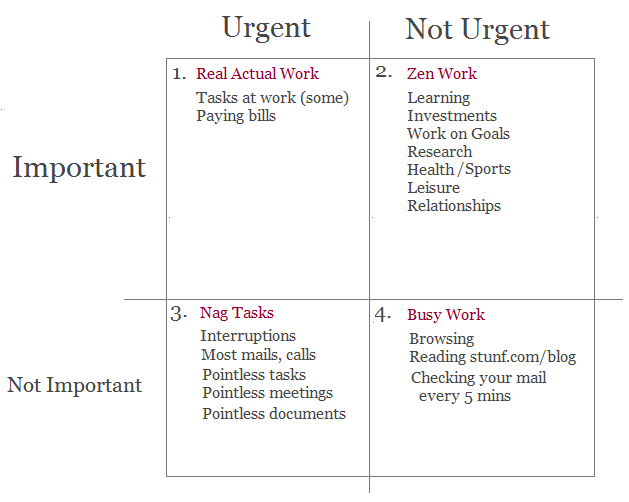 So, after working on Real Actual Work-tasks, you should start on tasks in category 2 (“Zen Work”). This forces you to eliminate (or delegate) as much as possible of category 3 tasks, or postpone them until you’ve done enough work in category 2. Many category 2 tasks have to do with achieving long term goals, whether it is brainstorming about new ideas, building relationships, doing research or simply relax to become more productive. The ordering of tasks in Thymer allows for a mix of using deadlines and the importance you assign to a task. Adding deadlines to tasks will automatically sort them if you want, but they can simply be dragged into a new planning that better reflects the importance. A special flag is available to mark certain tasks as extra ‘important’. Here’s an example of a todo list, in which some todos have deadlines, some have not. Some deadlines will be missed, as the tasks are not really important. Thanks for all the sign ups so far! It is pushing us to the top of the Uninformed Optimism phase (for the entrepreneurs amongst us: check out Tim’s blog, it’s an interesting read!). We also put up a new splash page for Thymer at www.thymer.com. What? You don’t have a blog?! Our new blog is live! With this blog we want to keep you updated on our latest developments. New features! New ideas! Youâ€™ll find them described right here. Occasionally we will rant about anything web and startup related, and share some of what weâ€™ve learned so far. Also, we will write about our mistakes, so that other startups may avoid them. Read more about Stunf (the company) and the Team.